Last week I wrote about 4 Twitter Basics, this week I want to take a look at some slightly more advanced ways to get going with Twitter. I’ll cover how to construct a “perfect” tweet, what content to think about in your tweets, when to tweet and building a following. I’m posting here based on several years of tweeting for myself and for (former) employers. I encourage you to get in and try twitter, the more you practise the more you’ll learn. Tweets can be 280 characters long; spaces, punctuation and emoticons count towards this total. Hashtags, handles and links do not. I tweet about digital subjects and I construct my tweets with text + link + hashtags. The text is why this content is interesting, the link is from a relevant reputable source, and I had two or three hashtags to help the search function. 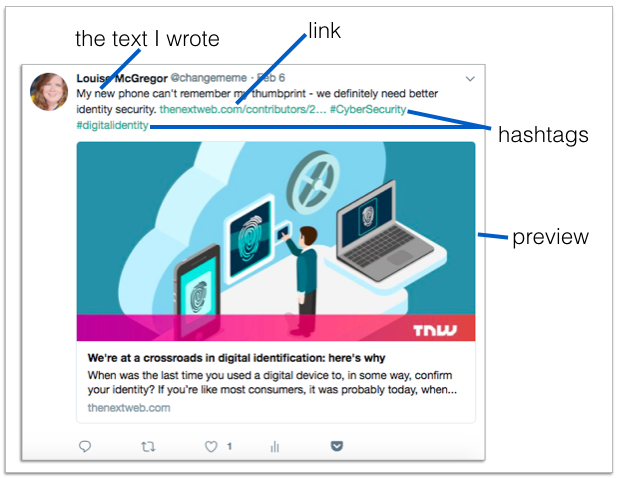 The preview is automatically generated by twitter and picks up an image from the article (if there isn’t an image you can add one separately). I try to balance my content between commenting on things I’ve found on the internet, publishing my own content and interacting with other people. I am probably tweeting most prolifically at conferences and events. I’ve also used it to comment on television programmes (Apprentice and Dragon’s Den in particular). Increasingly I use it to interact with brands – sometimes to to thank them, but more often to get support. Here’s my ‘how to’ for all of these content types. Your own content – I write this blog and connect it to my twitter account, meaning that every post is publicised on twitter the moment it’s published. This has an advantage because wordpress lets you schedule posts, meaning your tweet goes at the same time. I’ll also post personal observations, as I’m often in random locations to write there tends to be a coffee theme. 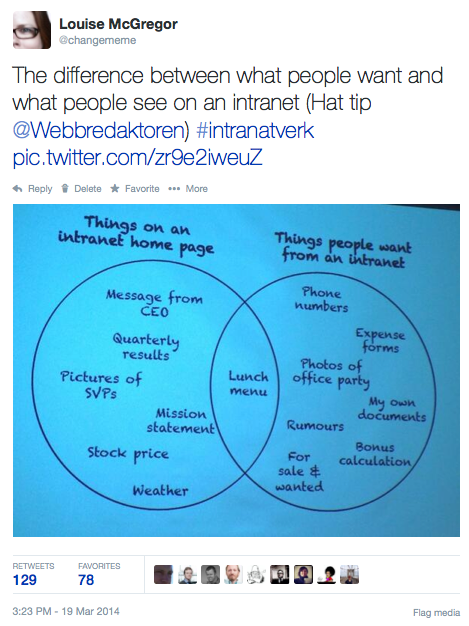 Events – I tweet a lot at conferences and other events, my twitter feed often becomes my “notes” after the event. It’s also a good way to find other people who tweet relevant content, and conversely a good way for other people to find you. – As well as using twitter I see a lot of articles, blogs and videos online every day. If I’m sharing a tweet I tend retweet it to give the source credit. If I find content some other way I will make a new tweet with my own comment. I try to credit the source so if I know a relevant twitter handle I will add it, as shown in the tweet at right. I want people to credit me when they share my content so it’s only fair I do the same. Second Screen – There’s a phenomenon going on where people watch TV, while interacting via a social media platform. I sometimes do this, mostly during the BBC shows “Apprentice” and “Dragon’s Den”. It’s fun, and a great opportunity to snark. Chat sessions – Twitter chats are a way to have an open discussion on twitter, at a specific time and usually structured via a series of questions. I’ve been involved in the #ESNchat, about enterprise social networks, but they cover every subject from architecture to yoga, from cakes to veganism. I’ve found a twitter chat schedule, with the appropriate hashtag, of course you can also start your own. Interaction with others – Don’t be shy – twitter become more useful and more fun the more you interact. Just use the @someone function, or reply to their tweets. Most often the person responds. Sometimes good stuff comes from it. Interaction with brands – Many brands offer a service channel via twitter (or facebook), and customers expectations have grown regarding the responsiveness and the content of the response. I’ve had mostly good experiences when I’ve used these channels, and companies are increasingly using Twitter as a service channel. Only people following you will see your content (unless you use the @someone function to address a person specifically), so if you’re sharing content you need to build a following of people to share it with and to interact with. Of course if you’re just using twitter to discover information then this isn’t so important, you can just focus on finding people to follow. Most people will follow you back, unless they’re in the stratosphere of the twitterati, where the follow back rate is typically less than one percent (of the top ten on twitter by number of followers no one follows more than 1% back). I tell you this to manage expectations. So the best thing you can do is follow people you find relevant and interesting. If you do this slowly and steadily your follower number will grow. DO NOT follow hundreds and hundreds of people each day, ( and do not unfollow hundreds and hundreds of people at once). You will look like an “aggressive follower” to twitter’s algorithm, which would then consider your account as likely to be spam. You also look less credible to potential followers, even humans think high follow to follower ratio looks spammy. DO NOT buy followers, it goes against the twitter rules and it doesn’t really add anything to your account. You won’t see better content, and you won’t have a bigger real audience. All that happens is a bit of PR kudos for having so many followers – until someone looks closer and figures out millions of those followers are fake – then the PR turns negative. If you post something on Twitter it’s public, and permanent. Don’t be the guy who tweets about his pay, don’t the sport’s fan that abuses players online, don’t threaten other twitter members, think before you make a questionable joke. Check the public shaming site for more examples. Twitter has moved to make reporting abusive behaviour on twitter easier, but there are still plenty of jerks around. Don’t be one. Publish a tweet in the format shown, include your text, a link, and 2-5 hashtags. Find five people in your field who are active on twitter and follow them. Ask your friends or contacts to follow you, you can make this request via other platforms, ask your friends on Facebook or Linkedin to follow you, you can explain that you’re new to twitter and want to build a following.